PASSWORD JDM CARBON KEVLAR POWER CHAMBER AIR INTAKE Made of aerospace quality carbon fiber, the Password JDM Carbon Fiber Power Chamber Intake surpasses any other intake on the market in quality, and in performance. 1996-2000 Honda Civic (All Models except Si) (EK). Made of aerospace quality carbon fiber, the Password:JDM Dry Carbon Fiber PowerChamber Intake for the 92-95 Honda Civic / 96-00 Honda Civic surpasses any other intake on the market in quality, and in performance. Simply swap this carbon scoop in place of your factory headlight and your done! Content: One Password JDM Dry Carbon Fiber Ram Air Scoop (2008-2015 Mitsubishi EVO X Only). All Password:JDM Dry Carbon/Kevlar products require professional installation. Password:JDM Dry Carbon Kevlar PowerChamber Intake 92-96 Prelude. Password:JDM Dry Carbon Fiber PowerChamber Intake. One Password:JDM Dry Carbon Kevlar PowerChamber Intake. One Password:JDM PowerChamber Air Filter. Made of aerospace quality carbon fiber, the Password: JDM Dry Carbon Fiber PowerChamber Intake for the 1992-2001 Honda Prelude surpasses any other intake on the market in quality, and in performance. All Password:JDM Dry Carbon/Kevlar products require professional installation. This is part of the normal body work and installation process. Password: JDM Dry Carbon Fiber PowerChamber Intake. One Password:JDM Dry Carbon Fiber PowerChamber Intake. Made of aerospace quality carbon fiber, the Password JDM Carbon Fiber Power Chamber Intake surpasses any other intake on the market in quality, and in performance. PASSWORD JDM CARBON FIBER POWER CHAMBER AIR INTAKE. Password:JDM Dry Carbon Fiber PowerChamber Intake 92-96 Prelude. Password:JDM Dry Carbon Fiber PowerChamber Intake. One Password:JDM Dry Carbon Fiber PowerChamber Intake. One Password:JDM PowerChamber Air Filter. Just like the original PowerChamber from PWJDM, this one makes more all around usable power and has the killer looks to back it up. Dyno Proven 10 WHP gains over base line with no other modifications made to the car. Made of aerospace quality carbon fiber, the Password:JDM Dry Carbon Fiber PowerChamber Intake for the 94-01 Acura Integra Type R, LS, RS surpasses any other intake on the market in quality, and in performance. The Password:JDM PowerChamber design makes more useable horsepower for normal and performance driving conditions. Password JDM Carbon Fiber Intake 06-11 Honda Civic Si. Made by PWJDM for PWJDM using our perfected Dry carbon process, this product is one of the finest real carbon pieces you will ever find. PWCPC-DC2-BGK 94 95 96 97 98 99 00 01 ACURA INTEGRA GSR (W/ ABS). PASSWORD JDM CARBON KEVLAR POWER CHAMBER AIR INTAKE Made of aerospace quality carbon fiber, the Password JDM Carbon Fiber Power Chamber Intake surpasses any other intake on the market in quality, and in performance. Password:JDM Dry Carbon Fiber INTAKE 94-01 Integra GSR DC2. Made of aerospace quality carbon fiber, the Password:JDM Dry Carbon Fiber PowerChamber Intake for the 94-01 Acura Integra GSR surpasses any other intake on the market in quality, and in performance. 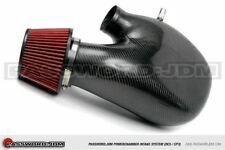 Introducing the all new Password:JDM Dry Carbon Fiber PowerChamber Intake for the 02-06 Acura RSX / 02-05 Honda Civic Si. Just like the original PowerChamber from PWJDM, this one makes more all around usable power and has the killer looks to back it up. All Password:JDM Dry Carbon/Kevlar products require professional installation. This is part of the normal body work and installation process. Made of aerospace quality carbon fiber, the Password:JDM Dry Carbon Fiber PowerChamber Intake for the 07-08 Honda Fit surpasses any other intake on the market in quality, and in performance. Made of aerospace quality carbon kevlar, the Password:JDM Dry Carbon Kevlar PowerChamber Intake for the 94-01 Acura Integra Type R, LS, RS surpasses any other intake on the market in quality, and in performance. Password:JDM Dry Carbon Fiber Ram Air Scoop/Snorkel for OEM Airbox. All Password:JDM Dry Carbon/Kevlar products require professional installation. This is part of the normal body work and installation process. Made of aerospace quality carbon fiber, the Password:JDM Dry Carbon Fiber PowerChamber Intake for the 2012 Honda Civic Si surpasses any other intake on the market in quality, and in performance. Content: One Password JDM Dry Carbon Fiber PowerChamber Intake (2012 and Up Honda Civic Si Models Only). Made of aerospace quality carbon fiber, the Password:JDM Dry Carbon Fiber PowerChamber Intake for the 94-01 Acura Integra GSR surpasses any other intake on the market in quality, and in performance. Password:JDM Dry Carbon Fiber PowerChamber Intake1994-2001 Acura Integra GSR. It’s everything you want for an intake system and all for under a grand! Made entirely of Dry Carbon, the PWJDM intake system is a combination of individual components designed to work flawlessly with one another. The Password:JDM PowerChamber design makes more useable horsepower for normal and performance driving conditions. All Password:JDM Dry Carbon/Kevlar products require professional installation. This is part of the normal body work and installation process. Contents: One Password:JDM Velocity Stack. - Password:JDM Dry Carbon Velocity Stack incorporates race proven intake technology into a product designed for daily driven vehicles. It is designed to optimize and maximize air flow rates entering the induction system. Made of aerospace quality carbon fiber, the Password:JDM Dry Carbon Fiber PowerChamber Intake for the 2016 Honda Civic 1.5 Turbo surpasses any other intake on the market in quality, and in performance. Password JDM Carbon Fiber Ram Air Scoop Airbox. All Password:JDM Dry Carbon/Kevlar products require professional installation. This is part of the normal body work and installation process. No clearcoat will ever applied by us to hide imperfections or correct blemishes commonly associated with Polyester resin like everyone else in the industry. Get everything you need to complete the install! The Password:JDM PowerChamber design makes more useable horsepower for normal and performance driving conditions. It’s pretty much a filter on a stick if you think about it. Made of aerospace quality carbon kevlar, the Password:JDM Dry Carbon Kevlar PowerChamber Intake for the 94-01 Acura Integra GSR surpasses any other intake on the market in quality, and in performance. The Password:JDM Dry Carbon Fiber Cold Air Induction Kit for the 2012 Honda Civic Si is the most advanced intake system on the market! Content: One Password JDM Dry Carbon Fiber Cold Air Induction Kit (2012 and Up Honda Civic Si Model Only). Made entirely of Dry Carbon, the PWJDM intake system is a combination of individual components designed to work flawlessly with one another. The Password:JDM PowerChamber Ram Air Intake System for the 2008 Mitsubishi EVO X is the new leader on the market! Keep cool air flowing to your factory air box with the Password:JDM Dry Carbon Kevlar Intake Snorkel for the 2010-2014 Subaru WRX. Using a unique, organic flowing design, our intake snorkel will set off the look of your engine bay, while retaining OEM functionality. Made of aerospace quality carbon fiber, the Password:JDM Dry Carbon Kevlar PowerChamber Intake for the 2012 Honda Civic Si surpasses any other intake on the market in quality, and in performance. Content: One Password JDM Dry Carbon Kevlar PowerChamber Intake (2012-2015 Honda Civic Si Models Only). All Password:JDM Dry Carbon/Kevlar products require professional installation. This is part of the normal body work and installation process. Made of aerospace quality carbon kevlar, the Password:JDM Dry Carbon Kevlar PowerChamber Intake for the 07-08 Honda Fit surpasses any other intake on the market in quality, and in performance. Password:JDM Dry Carbon Fiber PowerChamber Intake Box for the 2008 Mitsubishi Lancer Evolution X has arrived! Made entirely of Dry Carbon, the PWJDM intake system is a combination of individual components designed to work flawlessly with one another.